In the forex world, there are several brokers that offer a fixed yet a very low spread, along with that they offer more than one trading platforms and on those platforms, you can trade with multiple currency pairs. However, despite all these benefits few offer a user-friendly environment like Deltastock. There are a lot of worthy things being offered to the traders. This includes: a very low deposit that is applicable for both ECN trading and basic accounts, multiple measures to ensure their client is safe. They are not like other service providers who pay more attention towards experienced broker. In the deltastock platform, from new to experienced trader everyone is given his due to importance. We have tested almost every aspect of the deltastock and you will find the details below. Deltastock was founded in 1998, and its headquarters is in Sofia, Bulgaria. 1:200 is the maximum leverage offered by the platform. You only need a $100 minimum deposit in your account to start trading and with that the minimum lot size is 0.01. The platform offers a variety of international and national languages that are popular worldwide like English, Spanish, French, German, Romanian, and, etc. Trading through deltastock is divided in two models. Either one can use built in Delta Trading, or can go for the Metatrader4. In this review, we are actually testing the built in Delta Trading so that we can get to know in detail about deltastock platform. First important thing in the Delta Trading that came in front of us is the panes consist of four disjoints. All of these four can be handled independently. In the beginning we were too confused in how to use this as many of the top platforms offers all of the data on the single screen. However, when we got used to it we found it very useful. This is because this pane viewing helped us in keeping only that data sheets in front of us that is very useful. As mentioned earlier, the deltastock offers trading in both standard and ECN conditions. To grab ECN, a trader needs to be on the second level. This can be achieved through deltastock, Citibank, and many more. After a short journey on this platform which was for sure necessary, we found out this platform very useful for both automated and manual trading. When you will be crossing limits, an SMS notification will be sent to update you. For customer’s information, we remind them that this application is available in both browser-based and downloadable version. Apart from that, one can also access it through the cell phone. We have already mentioned some key features of deltastock. However, there are some more that are worth mentioning. For beginners, constant trading competitions are being offered by the brokerage to get the fun side of trading. Still, the hedging abilities along with charting tools were very worth using. If you are new to forex trading and are using deltastock with much knowledge of trading, then there is no need to worry as you can learn a lot through their educational centre. Customers are always kept updated with emails and SMS. You can contact service through email, phone, or live chat. According to us, from the brokerage point of view, the live chat is the best feature that can be used to get a prompt and detailed reply. However, if you want to talk through phone, you can call between 9am-5pm local time. According to our knowledge, deltastock doesn’t allow traders from various countries like Japan, USA, Iran, Cuba, Libya, Somalia, Afghanistan, and many more. This is quite shocking for a platform that has every good reason to be a part of. From the beginning, the multiple regulations gave us immense confidence. With that, the variety of available choice was a very satisfactory thing in the deltastock platform. Let’s have a look at the historical background and general information of Deltastock. 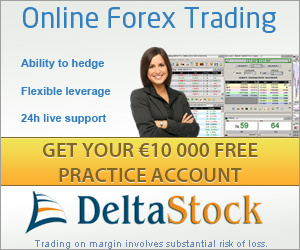 Deltastock started providing people forex facilities in 1998. Its headquarters are situated at Sofia, Bulgaria. According to the survey it is found that the maximum leverages of this company are 1:200. The minimum amount required to open an account on Deltastock is 100 U.S Dollar. They have a minimum lot-size of 0.01 lots. Deltastock has provided its users with the facility to communicate in various languages to minimize the communication gaps between them and their customers. The languages they are offering are English, Spanish, Russian, German, Rumanian, French and Bulgarian. The regulations found in Deltastock are MiFID, FSC, and BNB. There would be a number of forex brokers who would be offering lowest fixed spreads, various currency pairs, multiples platforms to trade through and a lot more incentives from trading point of view but there are very rare platforms that also provide their customers with a user-friendly interface to trade through them. Deltastock is one of them that also provide their customers a user-friendly interface. Deltastock tries its level best to make sure that all the customers are to ensure that each and every customer is provided all the major and minor details of stock marketing. Deltastock is offering its customers to trade through three major trading platforms. These platforms include the company’s personal trading platform, the delta trading platform and internationally accepted Meta Trader 4 platform. Now customers can easily choose any of them that best suit them for their trading purposes. If compare Delta trading with internationally accepted MT4 trading platform we will observe that Delta trading contains four disjointed panels that can be monitored on individual level which users liked very much because all other trading platforms gathers all the information in a single window because of which it becomes difficult to extract the information you require. Another positive point of delta trading platform is that it summarizes the whole trade in a very transparent and comprehensive way for the ease of users to understand the trading techniques with more accuracy and in an easy way. Apart from that delta trading is not only provides its customers a web based trading system but also facilitates its users by providing them with downloadable version. Delta trading system also facilitates its customers by providing them a mobile trading system. Apart from all these above mentioned facilities Deltastock also makes trading more convenient by offering their customers various user friendly features. We will discuss few of the most significant features provided by Deltastock for their users. The traders of beginner level find it really difficult as there is a constant competition between the traders. Although this thing is enjoyed a lot by those who want to observe every major and minor technicality of trading but this thing is not a fun ride for those who want take it as a pure business. For such customers Deltastock provide various heading facilities and charting tools to understand that thing in a more easy way.